This is not the article that one would expect: it’s not a single spot, rather a gallery of spots; there’s no proper address, no opening hours. It comes from my enjoyment of bus rides. Yes, although I’m not in my 80s and I’m perfectly able to walk, I truly like taking the bus, putting some music on and simply looking outside. It’s absolutely relaxing for me. 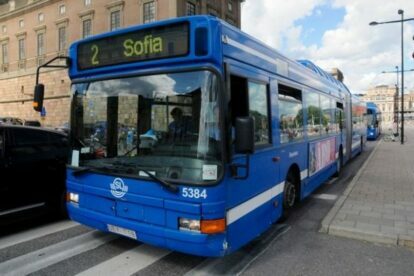 My favorite routes are the blue buses (1,2,3 and 4) because they go across the city passing by some of the nicest spots in the city center, and the rides are included in the transportation card (SL card) at no extra costs. A single ticket purchase is just 44 sek and is valid for 75 minutes. All routes are worth the ride. However, perhaps because I’ve been living at the terminus for a couple of years, my pick is line no. 2. Bus no. 2 leaves Vasastan to cross the northern part of the city center, it goes alongside the fancy district of Östermalm and continues toward the northeast edge of Söder, passing by the harbor, the Royal Palace in Gamla Stan and the view from Slussen. You get to see all the main areas of town, and you can decide to jump off anytime. Moreover, many of the stops are in the vicinity of the metro stations so it’s super easy and convenient to combine metro and bus and get the most of your time, especially if you have a tight schedule.